Parking is available in the 3 areas marked with P. More information is at the bottom of this page. Coming North on I-35W : Take the Highway 96 exit (the first exit after I-694). Turn right (east) onto Highway 96. Go past the light at US 10, and past the light at Hamline, approaching PH going east on Highway 96. Coming South on I-35W : Take the Highway 96 exit, turn left (east) onto Highway 96, cross over I-35W, and proceed as above. Coming East on I-694 : Turn north on I-35W at the cloverleaf, and take the next exit, which is the Highway 96 exit. Follow the directions above, turning right (east) onto Highway 96. Coming West on I-694 : You can either turn north on I-35W at the cloverleaf, proceeding as above, or take the Lexington Ave. exit. If you take Lexington, turn right (north) on Lexington, and proceed as below. Coming North on Snelling/Hamline : Go over I-694, keeping to the left to continue on Hamline. Hamline will T into Highway 96, as above. Coming North on Lexington : Go past I-694 to County Road F (the first light after the I-694 interchanges), turn left (west) onto County Road F, following it until it T’s into Hamline. Turn right (north) onto Hamline and follow it to Highway 96 as above. 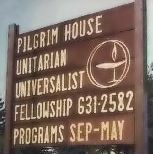 Coming East on Highway 96 : Pilgrim House is to the right of the road, after the light at Hamline Ave. but before the light at Lexington Ave. Look for our sign (pictured at right). If you miss the entrance to the driveway, the median on Highway 96 will require you to make a U-turn at a median break or at the Lexington light; then backtrack to another median break for another U-turn and a second pass. Parking is behind the building, and the main entrance to the building is from the parking lot in the back. Coming West on Highway 96 : From the Lexington light, go to the further median break (or to the Hamline light), make a U-turn, and approach going east as above. Pilgrim House Driveway: Because of the median in Highway 96, the driveway is right turn in and out. There are median breaks to the west at Arden Hills City Hall and to the east at the National Guard Armory, where U turns are permitted. Maximizing Pilgrim House Parking Lot: Occasionally the Pilgrim House parking lot fills up. We are no longer permitted to park along Highway 96 now that it has a turn lane. An additional 6 or 7 cars can be parked parallel to the curb on the east side of our driveway. Overflow Parking: Both Arden Hills City Hall and the Armory on the north side of Timberlake permit parking for Pilgrim House in their lots. The Armory lot is the closest to our driveway.